This all-purpose marinade is seriously the best meat marinade ever! It is perfect for chicken, beef or pork, and it only takes minutes to prep. Talk about a great recipe to have on hand for grilling season! Before we jump into the deliciousness I have for you today, I wanted to let you know that every week this summer (if the summer stars align, of course), I’ll be hopping on FB live with my kids to do a Cooking with Kids segment LIVE. My kids and I will be tackling all the recipes they make regularly, and we’ll be giving a lot of tips and suggestions along the way. Kids can rock it in the kitchen, too! If you have any specific recipe requests, leave them in the comments below. This week, the live cooking segment will be on Wednesday (6/14) at 2:00 p.m. (MST). The videos will be available to watch on Facebook after they are live, so don’t panic if you can’t join in right away. Although if you can, it’s a great time to ask questions while the camera rolls! Even though I’m one of those people that stomps out to the grill in knee-high snow to grill it up even in the winter, I definitely max out my grill’s potential in the summer months. 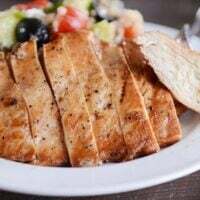 Easily three or four nights a week during June, July and August, dinner consists of grilled chicken or pork chops (sometimes kebabs, steak, or pork tenderloin, if I’m feeling fancy) with favorite, easy side dishes like skillet zucchini and squash or a go-to pasta salad or skillet potatoes. When garden produce is at its peak, often I just throw a handful of fresh-from-the-garden cherry tomatoes and peas on everyone’s plate (whether they are washed or not, depends on the picker) along with the grilled fare and call it good. Summer meals are the best. Light, simple, healthy. 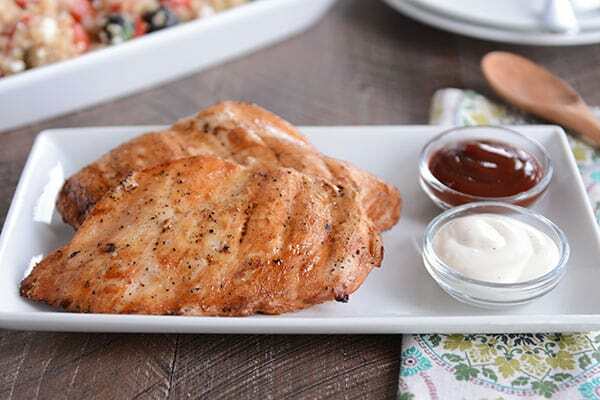 If you love the simplicity of grilling but want to make it even easier with one go-to meat marinade, this recipe is for you. This flavorful concoction of every day ingredients is the best meat marinade ever. It works wonderfully on chicken, pork, or beef for juicy, tender meat packed with amazing flavor. 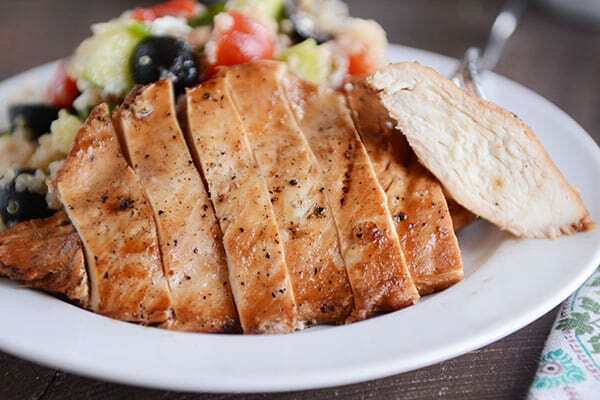 Yeah, sure, sometimes it’s fun to change things up and go for a specific flavor profile (like this lemon and garlic grilled chicken), but when you want a dinner decision that requires minimal brain power, this all-purpose meat marinade is for you. My friend, Bri, sent me this recipe a little while ago, and it’s quickly become the marinade I turn to most. I’ve used it with flank steak, chicken, and pork chops. All terribly delicious! I have a feeling it would be wonderful on salmon, too. While the recipe does require (a harsh word with no real follow-up) marinating the meat, I’m clearly not going to fire you if you choose otherwise. But, I highly encourage planning ahead so the meat can rest in the flavorful bath for at least 8 hours. Here’s a bit of dreamy news: the meat can hang out in the best meat marinade for up to two days, which means your make-ahead heart is going to be doing a happy dance when you can prep that far in advance. I haven’t tried it, but I’m guessing that the uncooked meat could be frozen in the marinade, as well. Take it out and thaw in the refrigerator for about 24 hours before slapping it on the grill. I always get asked about what grill I use when I post a grilling recipe, so I’ll give a quick shout out to my beloved pellet grill/smoker. I have the older version of this Camp Chef pellet grill; I’ve been using this baby for a couple years, and I’d never go back to my old charcoal or propane ways. It’s amazing. I love it. That is all. Tossing the meat and marinade in the Instant Pot might work a little magic, too. Place the meat in a shallow dish or ziploc bag. In a medium bowl or liquid measuring cup, whisk together the lemon juice, soy sauce, garlic, olive oil, ginger, onion powder and pepper. Pour the marinade over the meat to cover. Refrigerate for 8-12 hours (or up to two days). Grill the meat, discarding excess marinade, until cooked through (exact time will depend on the cut of the meat and temperature of your grill). Let the meat rest for 10-15 minutes before serving to seal in the juices. I've only ever used this meat marinade for grilling, but I suspect that if you let the meat marinade, you could pour the meat AND marinade into, say, an Instant Pot and quickly pressure cook until tender. ﻿Update: a couple of you have found this too salty even using low-sodium soy sauce. I made it again the other night using half soy sauce (still low-sodium) and half pineapple juice and it was just as yummy - so keep that in mind if you are worried about saltiness. This recipe has become my go-to when I need a quick, tasty, and easy marinade for meat. I use about 2/3 low-sodium soy sauce and 1/3 regular soy sauce in it and love the way it turns out. Hey Mel, huge fan of your recipes here. I’m hoping to get specific Instant Pot instructions. I’m a newbie to IP and need a dummy proof recipe. 🙂 It’s cold here so no grilling for me. Plus I want to make the IP my new best friend. Can’t wait to see more of your recipes IP converted! Hi Tiffany – a lot will depend on the type of meat you use. For chicken, I cook for about 12 minutes high pressure in the IP, for pork (roast) about 55-60 minutes high pressure, for pork chops about 25 minutes high pressure, and for steak probably about 30 minutes high pressure. Thanks Mel! Do you quick release the IP for all of these meats at the end of those timers? Also, is the marinade in this recipe a sufficient amount of liquid for the IP? I usually let meat naturally release for 10 minutes and quick release the rest of the pressure if I’m in a hurry – otherwise, I just let it naturally release all the way. Yes, there’s enough liquid in the marinade for the IP. I’d love more info on this grill and using it as well. We are looking at buying this grill but aren’t sure if it works for just plain cooking burgers and grilling chicken. We keep getting mixed info that smokers take a long time, or they don’t work well to sear the meat because they don’t get hot enough, etc. A man who works at our local butcher says he uses his traeger but has a separate propane grill just for the everyday grilling of chicken breasts and hot dogs and such. So we are just a little confused if this grill really will cover both functions. Love your input and would be grateful. Thanks in advance! I’m sure everyone has a different opinion, but we love our pellet grill and don’t use a propane grill anymore (our old one broke right around the time we got a pellet grill/smoker). I will say that the sear/char on meats isn’t quite as prominent with the pellet grill, but I actually feel like it cooks faster (I mean, it’s up to you to moderate temp; I cook everything at around 375 to 400 for “grilling” and obviously lower for smoking large cuts of meat for longer periods of time). I do have the sear box (powered by propane) on my pellet grill, and it’s great if you want that classic sear look/taste/texture, but if I’m being honest, I hardly ever fire it up and just use the main pellet grill part. These images looks yummy!!! I need to go get some of those skewer things so I can make this! Tried this marinade tonight. I used 1/2 cup low sodium soy sauce and 1/2 cup low sodium chicken broth, it was good, but still a little salty for our tastes. We love this both as written and with the half pineapple juice! I’ve made it a half dozen times already and plan to make it for a large group while we’re camping next weekend. Thanks so much for a great recipe! Sounds very good and am going to try it this week. I use coconut aminos as soy sauce alternative so will try with that. We have some hotdog sticks with long prongs, so made shish kabobs. We cut sirloin steaks into cubes and marinated them in this sauce (yum!). Along with the steak we stuck fresh pineapple cubes, red peppers, cherry tomatoes, and onion chunks on the prongs. We cooked them over coals in our fire pit and they were heavenly! The leftover steak cubes were used the next day by cutting the cubes into slices, cooking the meat in a non-stick fry pan with extra marinade, then making steak tacos. Two amazing meals. Amazing marinade, used it on some very inexpensive steak that would have been tough but the marinade saved the day. Tried again this week on pork and chicken and both were delicious. The lemons are magic. 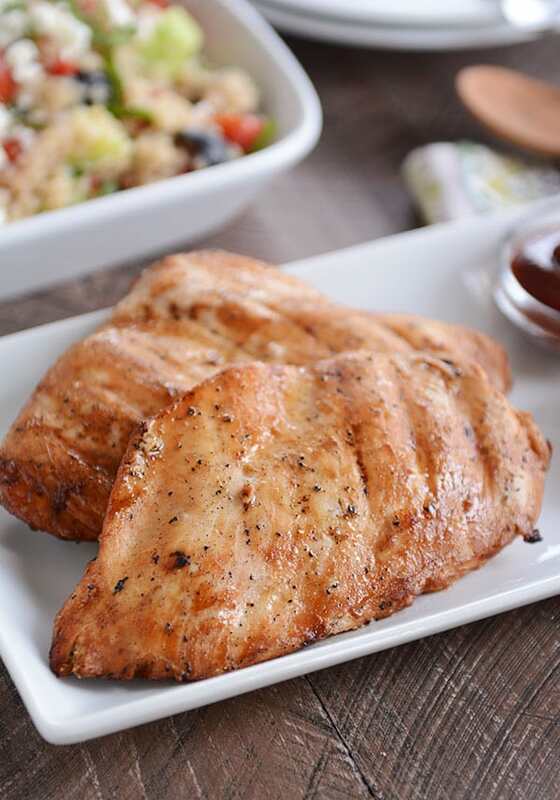 Thanks for sharing – it’s my new go to marinade – we can’t get enough. This was so good!!! I took my frozen chicken breasts out of the freezer, put them in a ziploc, added the marinade and let them thaw in the fridge. Our grill is broken (new one coming this week!) so I broiled them in the oven. Thank you for such a great recipe! I can’t wait to try it on other meats as well! Long time fan. I use more of your recipes than I can count! Just a tiny bit of feedback: I made this last night with the low sodium soy sauce (San J brand) and it was still way too salty. I marinated for about 7 hours. The only difference is that I pounded out the breasts first. They seem to cook more evenly on the grill this way. Maybe that made the meat absorb more of the marinade? The flavor (besides being too salty) was really good though and the chicken was incredibly juicy!! I will make this again, but use 1/2 the soy. Maybe sub with a little apple juice to balance it out? I hate to leave negative feedback. Your recipes are consistently the best on the internet! I appreciate and admire what you do so much. Thank you for sharing your passion and skills with all of us! I marianted my chicken in the fridge overnight (about 13 hours) and I followed the instructions exactly including the low sodium soy sauce and it was way too salty. Can it marinate too long? I was looking for a go to marinade but this one is not it. Any suggestions? Hi Mary – sorry this one didn’t work out for you! I suppose the marinating time could affect the flavor, but I’ve marinated meat with this up to 24 hours, so I’m wondering if it is just a difference in taste preference? How much meat did you use? Any chance there was too much marinade in proportion to meat? Great feedback on freezing the meat in the marinade, Amanda! We made this for supper last night and my husband said this was by far his favorite marinade out of all the ones I have tried the last few months. He LOVED it. Maybe it is because of the saltyness I really enjoyed it too- going in the rotation!! I made your lightened up alfredo sauce (part of the recipe with chicken and asparagus) over egg noodles because that’s what I had on hand. Great supper! Yum! I’m so happy you loved this, Amanda! I marinated chicken breasts in your marinade last night and since our BBQ grill is on the blink, I cooked them in my slow cooker. Oh, the aroma that filled the house this morning! The chicken is delicious! It truly is the best marinade!!! Thank you! Could you try coconut aminos? It’s a soy-free sauce that is often used as a sub. Have you heard of Tamari sauce? Another great alternative to soy sauce, but check ingredients first! I generally love your marinades, Mel (I adored “Grilled Island Chicken” and “Thai Coconut Milk Grilled Chicken” this spring. But I made this one last night and found it far too salty. Has anyone else found this? Any advice? I fundamentally liked it but just felt too chock full of sodium. Hey Sarah – did you use regular or low-sodium soy sauce? I have an aversion to low sodium soy sauce, but maybe that was the problem. I never like the low sodium version as much as full throttle, but maybe I should make an exception here. I assume that’s what you’d recommend? Thank you for responding! Hey Sarah, yes, I always use low-sodium (there’s a note next to the soy sauce in the ingredients indicating that’s what I use for this recipe). However, my friend Bri that sent me the recipe uses regular soy sauce for this recipe, so I’m guessing it really boils down to preference or salt sensitivity. Sorry it didn’t work for you! Mel — I’ll try with the low sodium. Because I don’t normally like low sodium soy sauce, I resisted, but I am curious to try it with this as I loved everything else about it. Please know, I LOVE your blog. I cook a lot, and yours is my favorite food blog. Thank you for providing such a wonderful service. Thanks, Sarah! And I love the feedback on recipes – both the positive and the constructive criticism. Appreciate you! First off…I’m a huge fan of yours. Second, what are your thoughts of using this marinade on tilapia? I assume not to marinade as long with fish, but other than that it seems like it would be good….I’m just going to throw caution to the wind and go for it! Yes, I think as long as you follow your own advice (don’t marinade too long!) it might work just fine! 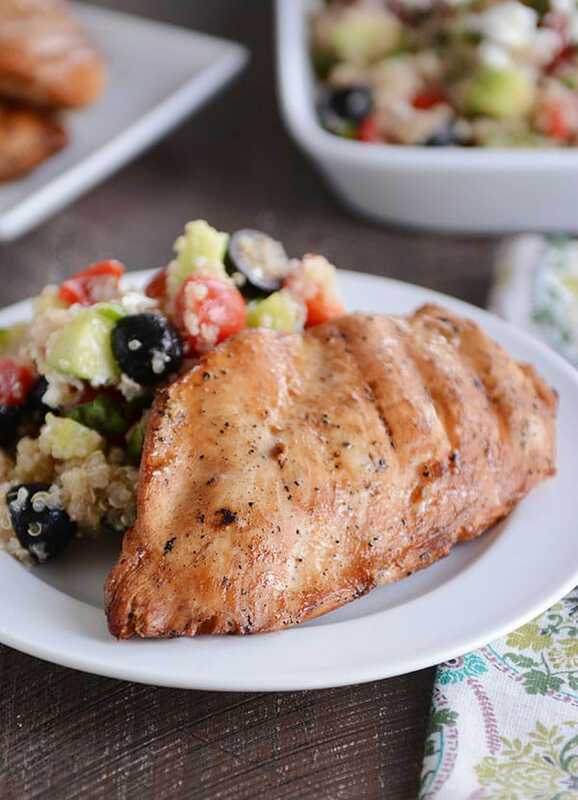 I tried this recipe with tilapia with good results. The flavor was strong…maybe a little too strong. I let it marinate for a little over an hour , so next time I’ll shorten that to 20-30 mins. Also, I should have halved the recipe or even quartered it. That’s on me, I didn’t think that through. Great recipe! I’m excited to try it on beef or chicken. On a side note, I googled up a Mediterranean quinoa salad to serve on the side that was terrible. Very vinegary. I’m looking forward to the one you will be sharing soon. So far we’ve enjoy most everything we’ve tried that you have shared. Thank you Mel!! Keep up the great work! Thanks for the update, Jodi! That salad is coming next week! Mmmmm looks good was my first thought when I opened your site. Have to make this and soon. Thank you for sharing. Looking forward to adding this marinade to my arsenal! 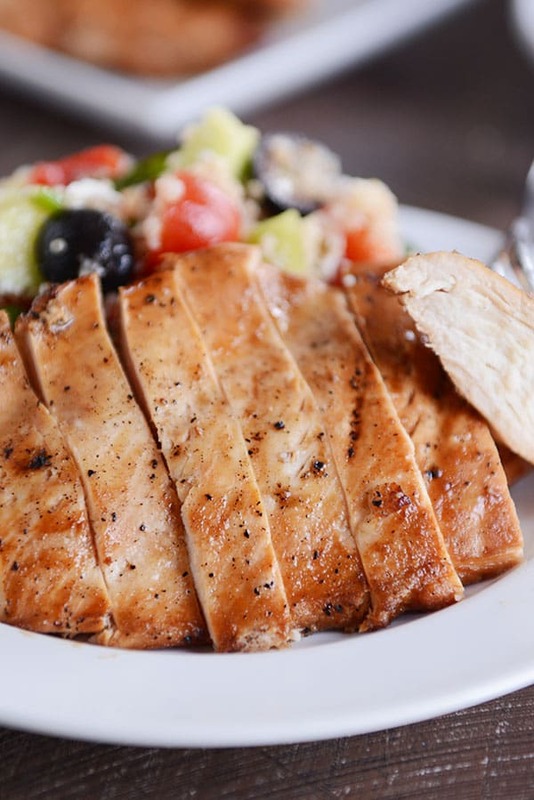 I have some Grilled Island Chicken marinating in the fridge right now, but next time, I’m going to give this one a go! About the camp chef, do you have the sear box on yours? We need to upgrade our grill soon, so this has me intrigued. And how much do you end up spending on pellets? I just have no idea, since I’ve never had a pellet stove/smoker/grill. I love the idea of setting it to a temperature, and taking the guess work out of it! Can you get a good juicy burger/chicken breast without the searbox? I don’t have the sear box and haven’t felt like I really needed it (although maybe if I had it, I’d know what I was missing). As far as pellets, that’s a good question. I use my grill a lot but I’m usually doing short cook times and not super long smoking sessions (like for brisket or ribs). I probably go through a 40 pound bag (about $30-35) every 3 months or so – so maybe $10/month for pellets? Right around there. Can’t wait to try it! Thanks, Mel! You’re the best!!! I want to try this this week! I love a good marinade! Just realized it was onion flakes. I’ll try onion powder next time! And I realized it def wasn’t a typo! Oh my gosh! I’m so happy you love this!!!! Flank Steak is our favorite dinner because of this marinade, but I’ve never tried it with chicken or pork! I was reading this excited to get a new marinade recipe, getting excited to try (grill almost daily!) Then I saw my name! I feel famous!!! The good news is, I’m excited to try this old recipe on the other meats! Mel, you’re the best! Also, is it really a tablespoon of onion powder? Or is that a typo? I can’t wait to try this. I use a marinade with all of the same ingredients (except no fresh lemon juice) but the proportions are totally different, and mine has the addition of worcestershire sauce. I love mine; I’ll be excited to see how yours compares. Your marinade sounds delicious, Alicia! and thanks for the kind comment. I always enjoy seeing your comments pop up (I always recognize your email address). 🙂 Thank you so much – it means a lot to me. Looks great per usual! What is the quinoa dish in the photo? I want to make that meal. Yum! Good eye, Alicia! It’s a Mediterranean quinoa salad that in my humble opinion is to die for. I’ll be posting the recipe next week! I will patiently wait to make this then. Thanks. This looks amazing! I can’t wait to buy our new grill so we can try this out soon! You can bake if you don’t want to grill. Works fine, at 400 degrees, time dependent on whether you use cutlets or breasts. Because of marinading, it does not dry out. I am excited to have this marinade recipe in my arsenal-Thx, Mel. Quick question. I just got a camp chef grill but must admit am a little baffled trying to follow the getting started recipes in the booklet. I spoke w a very nice person at the company before buying it, but I need more pellet grill for dummies intensive help w the basics. The person mentioned their FB page; it was probably me not looking in the right place, but I didn’t find much there. Nothing I’ve made so far has worked out that well yet. Is there a spot online that details info on how to use pellets, auger, temperature setting etc. when throwing on the basics like chix breasts & burgers? I’m just not sure how to get a juicey, yummy result. That’s a great question, Lauren. Sorry you are having trouble. I use the most basic functions with my pellet grill. Whenever I’m grilling every day chicken breasts, burgers, steaks, etc, I turn the front knob to 375 degrees and let it fire up and preheat. I keep the top triangular cap (coming out of the smoke stack) twisted down so there’s only about 1/2-inch between the top of the pipe and the bottom of the cap, if that makes sense (I never change that). Then I just put the meat on the preheated grill, close the lid, and flip them halfway. I find at that setting on my pellet grill that chicken takes anywhere from 4-6 minutes per side (depending on thickness). I agree that it might be nice to have a more basic set of instructions – or at the very least some type of forum or website to help. Let me do some digging and see what I can find. Hi Lauren! Pardon the intrusion but we just got this grill on Saturday and my hubby set to work that evening on baby back ribs. Put on the rub overnight, then used the tried and true 3-2-1 smoking time (3 hours uncovered, 2 hours in foil, 1 hour uncovered) and they were AMAZING!!!!! Used high smoke setting the whole time. And for that 6 hours of cooking you really could hardly tell any pellets had been used. Very efficient! We are trying chicken tonight so hopefully fast and works as well as slow. Thx, Teri! Good to know how it went for someone else!